Mark Evans has this to say “Imagine taking a sniff of some ginger powder – nice and gingery, seedy and dry. 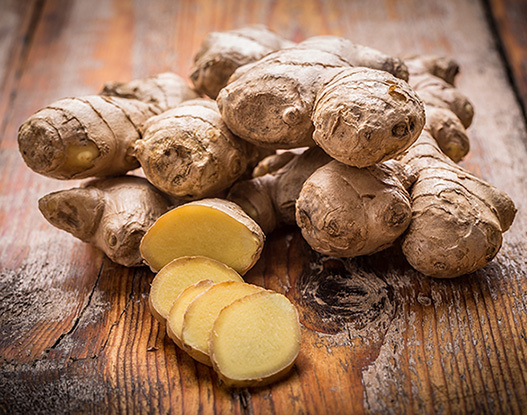 Now imagine taking a sniff of freshly cut ginger – wow, so much difference! It’s alive with a fresh, bright, lemony zing, warmly woody with a rooty pepperiness. So much more complex, aromatic and appealing. This is the difference between a regular distilled ginger oil and this beautiful select ginger CO2. The low pressure used during extraction has concentrated the most aromatic volatiles and freshly pungent top notes of the ginger root. It is mouth wateringly good. When you first open the bottle, it’s as if Angus Young’s arpeggiated riff starts playing in the background. The drop forms and your heart starts racing like the whole band is singing “ah-ah-ah-ah ah-ah-ah AH THUN-DER!”. It reaches the strip and, before you even realize, boom! You’ve been thunderstruck. This CO2 offering is like Germany’s 7×1 win against Brazil in World Cup 2014: it comes unseen, tramples your senses and goes away leaving lasting marks on your soul (in this case, I must say, beautiful ones). Fresh, high octane beauty at your hands that, despite its oomph, neither follows the credo ‘live fast, die young’ nor overstays its welcome. This material can be the shining star in an Indian tea accord (with other spices), the bustling opener to a radical take on white flowers (it may be odd, I know, but Chamomile loves this), the ‘gotcha factor’ in an otherwise no-nonsense woody concoction (feeling that your Copaiba or Amyris is too muddled?) or, my favorite approach, Tobacco Burley’s vitriolic best buddy ever.